Our family spent a combined 172 years at Pineview Dixie Youth Baseball Complex. Or so it seemed. When my brother and I were young, Dad played softball in a church league. A lot of our childhood was spent watching fast-pitch softball. Really I roamed around within mom’s eyesight, playing in the dirt. I don’t remember much about the games, but I remember being dirty. One game, dad took a softball off his knee way faster than he pitched it and his diamond days began to fade. But as soon as he hung up his cleats, my brother was old enough to lace up his own. Dustin started in t-ball at Pineview and worked his way up to coaches pitch and then to minors and majors. Dad sat on the Board of Directors which meant long after baseball was out of my bother’s system, dad would go back and keep the scorebooks for tournaments and other events. The Pineview cast of characters still live in West Columbia lore. Wally had leathery skin and a wiry frame. He coached for years and also maintained the fields. But he didn’t want anyone to know it. Long after everyone was gone, the lights would stay on and Wally would cut grass and rake infields. Coach Gil was a stocky man with a bushy beard. He looked like he walked straight of out of the Shire. I can’t recall a time we were at the field and Coach Gil wasn’t there. Mr. Hillenbrand. He was Pete’s dad. Pete played on the same team as my brother and he was stellar. But his dad was famous for shouting “Let’s go Pete!” nearly 100 times over the course of a game. If I close my eyes at night, I can still hear it. I’d never wish ill on anyone, but as a kid, if I could have picked someone to be mute, it would be Mr. Hillenbrand. I spent the majority of my pre and early teen years at the ball field. Dustin’s baseball practice was one of the first places my parents would allow me to drive. If you want your driver’s permit, you have to take your brother to ball practice. One of my first crushes was the assistant coach on my brother’s team, but he was engaged and 25 years old to my 15 so it was doomed from the start. We ate countless canteen dinners of corn dogs and crinkle fries. We packed team snacks, sat on the metal bleachers, lugged the over the shoulder VHS camera to the field, we cheered. We were sunburned with gravel in our shoes. But every night, after the practices or games or team dinners, religiously at 7:35pm on TBS, we watched the Braves. Remember when Ted Turner owned all of Atlanta and you didn’t have to chase the Braves around seven different stations? The Thompson’s were baseball people. As we grew, baseball was a thread woven through all our years. We tell the story about the thousands of baseball cards my grandmother threw out when my dad joined the Navy. Dad swears we would be rich if he still had those. Or the time at a Brave’s game, nine-year-old Dustin had a foul ball yanked out of his hands by a guy three rows behind. We were all surprised mom held her cool enough not to deck the guy. And then there was Dustin’s baseball card that had John Smoltz’s picture but Tom Glavine’s name. Or when grandad in a fit of anger called Bobby Cox, “coach stupid-head,” and somehow it stuck. When we were older, watching the Gamecocks win multiple College World Series. Even so, my first Braves games will forever be a favorite memory.My mom had relatives in Stone Mountain, Georgia, and when I was around seven years old, we piled in our car and took a trip to visit them. Though the Braves were in last place, playing at Fulton County Stadium in front of 5,000 people, dad was not deterred (it should be noted that being Braves, Cowboys and Gamecock fan produces a certain amount of steadfastness in a person. I think long-suffering might be the word. That or crazy).Dad, Uncle Jimmy, our cousin Josh and I jumped into Uncle Jimmy’s talking station wagon – when you left the door open a pleasant female voice informed you “Your door is ajar,” a precursor to Siri – and drove to The Varsity for hotdogs and then on to the game. It was hat day and every person received a navy blue baseball cap when you walked through the turnstiles. Our seats were nosebleed, first base side. We sat in the Georgia-in-July heat as long as we could with little blue streaks of sweat running down our faces. The hats were so wonderfully cheap, they bled all over our faces. I remarkably remember almost everything about that day because it meant so much to me. 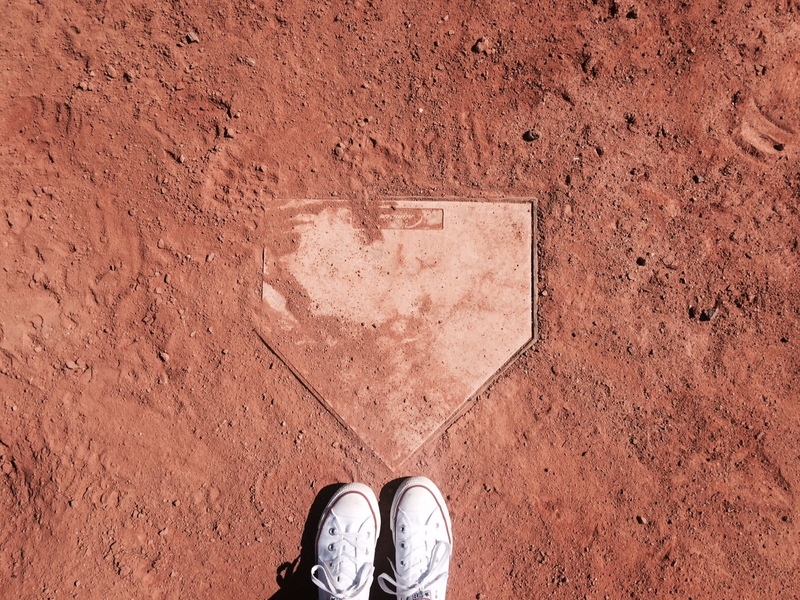 A couple of days ago on my way to pick up a friend, I passed a little league field. I wanted to pull over, blend into the crowd and watch for a few minutes. This time of year is special. Peanuts, sunflower seeds, uniforms that are a little too big on everyone, grass, clay, dirt. But still, when I watch a game whether on TV, sitting in the bleachers or in a multimillion-dollar stadium, it feels like home. It reminds me of family, of team, and that the best things in life are done together.